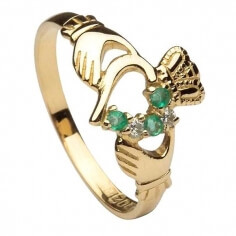 This beautiful Claddagh ring has the heart section set with a sparkling diamond and three bright green emeralds. 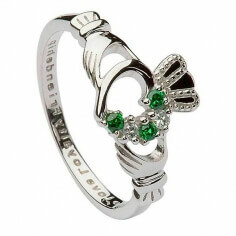 This is a modern take on the classic Claddagh design, handcrafted from 14k white gold and with a total gem weight of 0.45 carats. The two hands represent friendship and the crown signifies loyalty and fidelity, while the heart represents eternal love. Inside the band is the hallmark of the Dublin Assay Office.